How it works: Foundational health restore – Equolution – All the Equine Science w/o All the drugs! Equolution – All the Equine Science w/o All the drugs! For questions, email us at support@equolution.com or call us at 747-666-5758. The hierarchy of dis-easing events gets kicked off by a trigger (root cause) which can often be traced back for years. 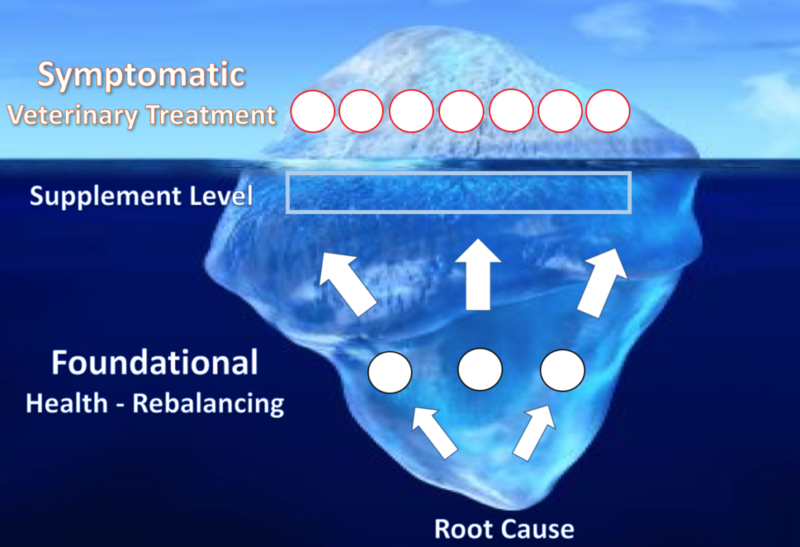 For a long time the body will try to rebalance health and fight under the clinical surface. This process requires energy. Ultimately the process exhausts itself and manifests through a variety of clinical symptoms. Groups of symptoms can have the same underlying reason. Example: Hives are a symptom of allergies. We consider the allergies a sign of a weakened immune system having its root cause in an imbalanced endocrine mechanism. By resetting the endocrine mechanism, the allergies lessen and/or subside completely. How does it work at the barn? Programs are developed remotely via email and phone or on-site. We also offer educational- and certification seminars, group clinics and webinars. While we have baseline programs for different types of horses and conditions, for best effect you should have your horse evaluated. Every customized program starts with such evaluation. The evaluation can be done online remotely from anywhere in the world or onsite at the stable. In both cases information about a horse’s health history, diet, problems and previous lab tests is needed. In many cases we can develop a program for a horse without additional cellular nutritional testing. But to custom design an individualized program without missing anything, especially when working remotely, a cellular nutrient evaluation is highly recommended. All we need is a teaspoon of the horse’s mane hair. From the evaluation and your goals, we develop a custom nutrition program for each horse. Those easy-to-administer programs are designed for you to rebalance your horse’s health, maintain health or to boost Equine performance. All programs are a combination of oral natural formulas and health-promoting equine diets. You receive step-by-step instructions in writing. Although improvements are often noticed within days, health-recovery programs are typically designed for 90 days. We strongly urge to pursue the program with diligence and attention to detail for the full duration, even if the horse seems well already. After 90 days we recommend a re-evaluation. It is essential that you provide feedback to your practitioner so the program can be adjusted if needed. How long it takes for your horse to heal depends on the diligence in pursuit of the program, as well as the duration of the problem and the organ systems involved – for example: hoof horn regenerates much slower than stomach lining. Self-healing takes time. If you have an emergency or need treatment, call your Veterinarian. Equolution®’s practitioners are independent consulting experts and educators. We do carry a small selection of self-developed, proven foundation formulas. In need of supplements and/or feed products we currently do not offer, we provide you with the source and recommendations from several third companies, depending on ingredients and individualized need. The Equolution® process requires you to have an open mind and let go of preconceived notions. The approach is natural and there are no side effects. The new way if thinking is to focus on your goals rather that the absence of health. For example, instead of accepting a horse’s metabolic condition and treating the subsequent damage, Equolution® will show you how to modify the equine metabolic response with a particular dietary approach and natural MRMs (Metabolic Response Modifiers). This goes along with symptomatic treatments by your Veterinarian as long as it is deemed needed and will be subject to your Veterinarian’s assessment. We enjoy networking with your Veterinarian. The process of Equolution® is based on scientific principles of cellular health. A body consists of millions of individual cells. To heal the body, the cells have to heal. To re-balance cellular health, essential nutrients need to get into the cell and toxins have to get out. To accomplish this, Equolution® uses a nutritional approach in which combinations of oral formulas produce a synergistic effect. For example, to get amino acids from food into the cell, they have to pass the gut–blood barrier. Conventional feed labeling suggest that all nutrients listed on the label will be absorbed by your horse. However, as Equolution studies have shown: many nutrients do not get absorbed at all unless a specific delivery mechanism is applied in clinical potency, e.g. digestive enzymes. Read more here.